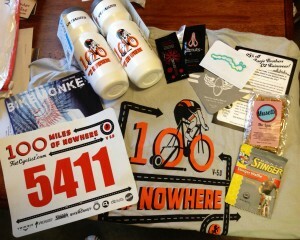 My kit of goodies for the 100 Miles of Nowhere arrived in my mailbox yesterday. There’s nothing like getting a package in the mail. Granted, it’s probably more exciting when it’s something unexpected (unless, it turns out to be a bomb), but I’ve always been a big fan of receiving something in the mail larger than an envelope and I don’t see that ever changing. Most notable in the package is the awesome Twin Six t-shirt. Being a graphic designer, the designs of most cycling gear pains me. But Twin Six was started by a couple of bike-crazy graphic designers and their stuff is awesome. I’ve only got one Twin Six jersey, two shirts and some socks, but I hope to soon add to the collection. (The $16 gift card that was also included in the 100 Miles of Nowhere kit definitely helps.) My need for a good stock of cycling clothing was pretty immediate, so I’ve stocked up mostly at the local shops. Which is not a problem at all, I love supporting my local bike shops and will continue to do so. I wish the one shop in the area that is a Twin Six dealer would carry a full line, I’ve only seen t-shirts there. But, anyway, now that I can afford to wait a week for an item to be shipped to me, my future bike clothier of choice will be Twin Six. If you want to win a designer over, design great looking stuff. I’m OK with the jerseys I’ve got from other companies, but I err on the side of plain, since cycling clothing can get rather loud and obnoxious quickly. Along those same lines, the two Specialized water bottles sporting a Twin Six design are also flipping awesome. I thought they would just be plain bottles, which would have been fine by me, this just makes them more awesome. Really all this does is get me more jacked up for the ride. I’ll be doing my 100 miles on June 23. I feel like I’m ready to go. I’ve been riding a lot lately and feeling pretty good despite the sudden heat wave that has gripped Arkansas. Not that heat will be too much of a factor during my 100 miles right here in my office under the sweet, sweet air conditioning. I must point out, though, that my office is the hottest room in the house thanks to an east-facing huge window. That’s OK, I’ll have plenty of food and drink available just a few short steps away. This is going to be epic folks, stay tuned.